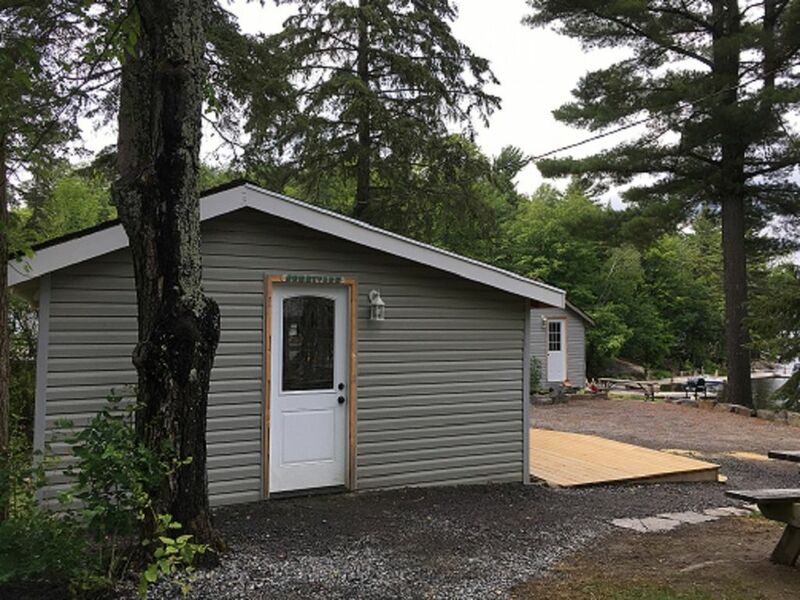 Forest Rock Resort is a family and pet friendly resort offering studio, 1, 2 and 3 bedroom waterfront cottages located on beautiful Three Mile Lake in the heart of Muskoka. Just 2 hours north of Toronto, come revel in the beauty of nature and discover why Muskoka is one of Ontario's premier destinations. Sunnyview is a newly remodeled 2 bedroom cottage (2017 - photos to be posted) that is next to the children's playground and steps away from our beautiful beach. It is a 2 bedroom cottage which sleeps 6 people max. The cottage has a fridge, stove, microwave, kitchen table and chairs, air conditioning and a 2 piece washroom. Outside is a picnic table, gas BBQ (first tank complimentary) and a private fire pit. Close to private shower facilities. All cottages are designated non-smoking and are equipped with toaster, coffee maker, kettle, dishes, pots, pans, cups, glasses and cutlery. To get you started, each cottage is provided with dish soap, a tea towel and toilet paper. Beds are provided with a mattress protector and pillows. NOTE: You are required to bring your own bed linen (sheets, pillow cases, blankets), bath/beach towels and personal items. During Jul & Aug, preference is given to wkly (Saturday to Saturday) cottage rentals. Wkend or partial week rentals during July and Aug are accepted based on availability and offered at a premium rate not otherwise posted. Security Deposit of $500 will be taken at checkin and will be returned after checkout assuming there is no damage or theft. In addition, cottage must be cleaned prior to checkout or a fee of $175.00 plus HST will be charged against this security deposit. Memories ... RELAXATION, ADVENTURE, ROMANCE, FRIENDSHIPS AND FUN!! Security Deposit of $500 will be taken at checkin and will be returned after checkout assuming there is no damage or theft. In addition, cottage must be cleaned prior to checkout or a fee of $175.00 plus HST will be charged against this security deposit. Extra person fee of 30 per person per night after the first 6 guests.